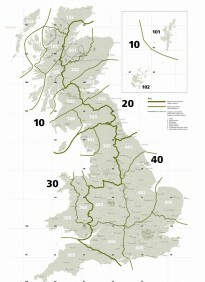 The Forestry Commission recommends the best seed sources to be used to conifer planting and for most conifers, this seed source is located abroad and suitable for planting throughout the UK. Alba Trees follows this expert guidance, sourcing the most highly improved seed from those recommended areas, but at the same time liaising closely with Forest Research to ensure that the seed is not known to carry any harmful pests or diseases: biosecurity is our top priority. Source Identified (SI): Comes from general of specifc locations within a single region of provenance or seed zone altitude band in which no specific superior qualities are recognised. Selected: Collected from stands showing superior characteristics, e.g. better form, growth rate and health. Qualified: Derives from the selection of superior individual trees which have not undergone any form of testing. 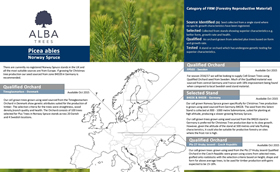 Tested: Derives from the selection of individual trees or stands that have undergone evaluation for genetic quality or have been shown to be superior, in comparison to accepted standards. 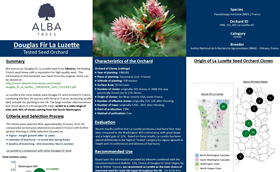 The renowned ‘La Luzette’ seed orchard is suitable for most sites throughout the UK and will grow with better form and later bud burst. 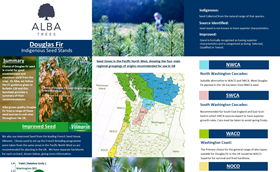 If you are not using improved stands, the FC has recommended the appropriate seed sources from the indigenous areas in North West United States. We summarise the options here. Norway Spruce is often used as a good alternative to Sitka and tolerates wetter, more compacted soils than Douglas Fir. 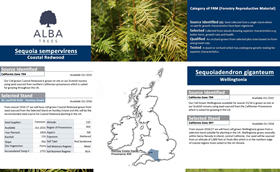 Both Coastal Redwood and Wellingtonia are good choices for warmer, wetter parts of the UK. Although they can be frost tender, both are fast growing, deep rooting trees. Fast growing and with naturally durable timber, both Western Red Cedar and Western Hemlock are becoming increasingly popular in Britain’s forests. 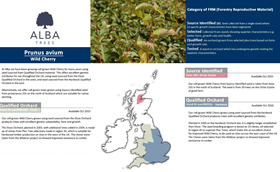 The Forestry Commission also recommends the best seed to be used when growing broadleaves for productive purposes and most of these sources are located within the UK. There are new stands of Silver Birch now in commercial production and these should be used when timber or fuel wood are objectives. 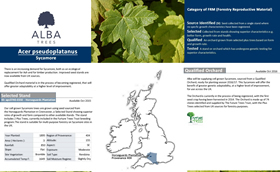 Our factsheet gives recommendations about the best seed to use for your site. 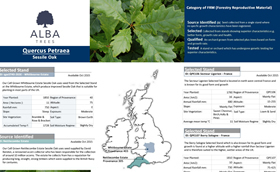 When growing English Oak with timber as a potential objective, it is important to choose the best available provenance to ensure optimal form and growth rate. 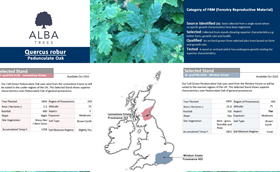 Sessile Oak is often chosen as an alternative to Pedunculate for wetter areas. With fast growth rates and good timber, Sycamore is a very popular choice in areas where squirrels will not damage the tree. Well grown Wild Cherry (Gean) can produce some of the most valuable timber of all the native broadleaves. Our Wild Cherry orchards are progeny from the Wildstar project. When growing native forests, the Forestry Commission will ask that you use native seed sources. 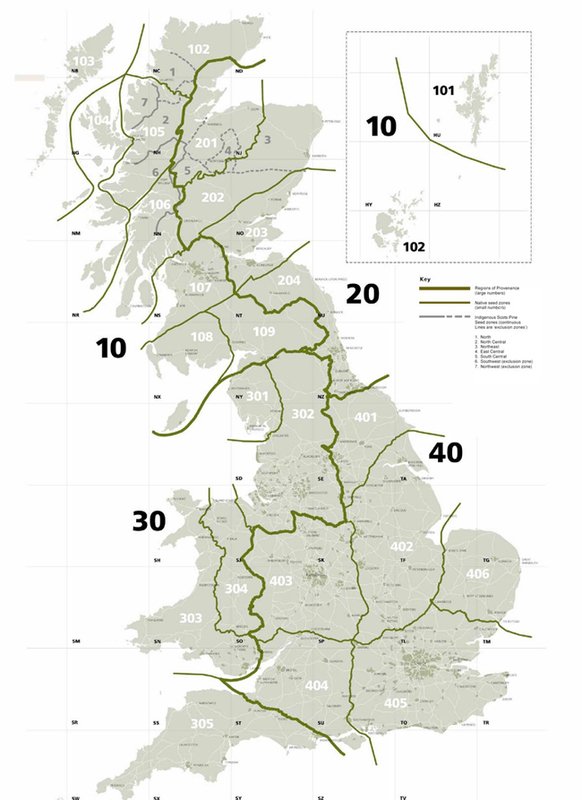 The UK is split into 4 Regions of Provenance, which are further split into Native Seed Zones. Often, the FC will ask that you plant trees which have been grown from a zone local to the planting site, but this should be considered against the potential effects of climate change and also against current availability. 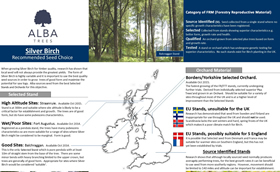 Alba Trees uses a wide range of seed sources throughout the UK, so please discuss your requirements with us. 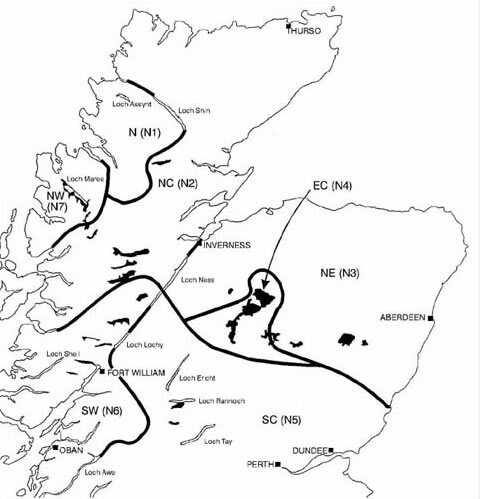 When planting Scots Pine for conservation purposes, there are fare stricter restrictions on choice of planting stock than for other native species and a local pine stand should be used. 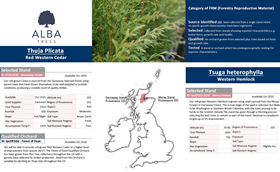 Alba Trees stocks plants grown from the widest range of pine stands and has been involved in restoring Scotland’s ancient Caledonian Pinewoods for over 25 years.